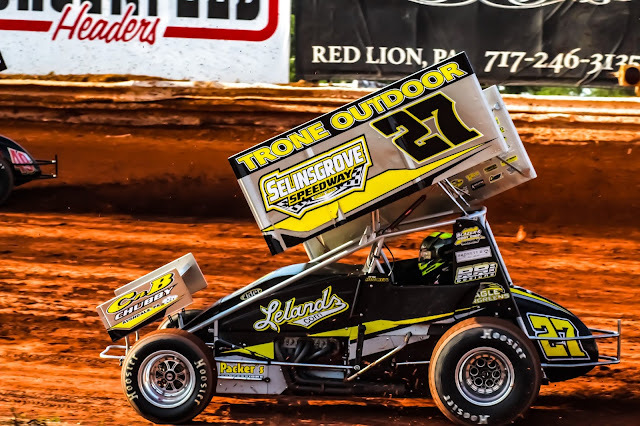 Mechanicsburg – Greg Hodnett won his first 410 sprint car feature of the season on Friday night at Williams Grove Speedway, driving by TJ Stutts on a restart to get the $3,800 victory. The win was the 73rd of Hodnett’s career at Williams Grove. The Tri-Track Challenge super late model main was taken by Jason Covert after a horrible opening lap backstretch crash that claimed some 10 cars out of the field. TJ Stutts and Hodnett had the front row for the stat of the sprint car main and Hodnett dogged Stutts for the lead from the very start but couldn’t find a way around him despite relentless efforts to snag the top spot. The first caution flag of the race appeared on the third lap, breaking up the battle and only one more lap could be completed before the red flag unfurled for a backstretch rollover by Jared Esh. Hodnett again stalked Stutts when action resumed but no matter what the Spring Grove driver tried, Stutts was able to keep him at bay. The leaders entered the backmarkers on the 12th tour, still with Hodnett hounding Stutts. And then on lap 14 another red flag came out, this time for a first turn flip by Steve Buckwalter. The ensuing restart saw a different stragegy unfold for Hodnett as instead of racing into the first turn a lane higher than Stutts, he entered way up top on the cushion and blasted the top to get a nice run off of the second corner. This gave him a surge down the backchute that allowed him to bolt to Stutt’s inside in the third turn and take control of the event with 10 laps to go. Hodnett never looked back after taking over the point while Lucas Wolfe took second away from Stutts with eight laps to go. Wolfe was making good time around the track but Hodnett ended up taking the win by 2.650 seconds with Cory Haas crossing the line in third followed by Stutts and Freddie Rahmer. Sixth through 10th went to Anthony Macri, Brandon Rahmer, Rodney Westhafer, Jimmy Siegel and Ryan Taylor. Heats went to Stutts, Hodnett and Brandon Rahmer. The 30-lap super late model main saw Rick Eckert and Coleby Frye start on the front row followed by Tyler Bare, Jason Covert, Jeff Rine and Bryan Bernheisel. Frye got the drop on Eckert when action began but “the big one” was soon to follow as Jeff Rine, Tyler Bare and Covert went three-wide down the backstretch. With Rine down low and Bare in the middle, Bare was the first to back out of the throttle as the trip approached the end of the backchute but as he did so, contact was made with both Covert and Rine. And while Covert kept control, Rine got turned sideways and slammed head-on into the inside guardrail before careening back up across the track as the entire field bore down on him and the third corner. Massive carnage and tremendous impacts ensued with 10 cars collected in the melee. Involved was Rine along with Gary Stuhler, Billy Wampler, Bare, Mike Lupfer, Reese Masiello, Matt Nailor, Dave Brouse Jr., Jamie Lathroum and Jerry BArd. Luckily, all drivers were reported to have escaped injury although several cars were totally destroyed. Rick Eckert then beat Frye back to the line when the first lap was restarted with Covert up to third. Covert took second from Frye on the third lap and gave chase of the leader from that point on. Slowly but surely, Covert tracked down the pacesetter, racing to Eckert’s inside repeatedly in the third corner. He finally made the move work on the 15th tour, edging to Eckert’s inside at the line and then seconds later, Eckert slowed to a stop with a blown left rear tire. A final caution flag with nine laps to go produced an exciting three-car battle for second between Dylan Yoder, Frye and Bare who restarted at the rear after the opening lap carnage. The trio swapped the spot several times over the final laps before Frye took it for good while Bare ended up third followed by Yoder and Matt Cosner. Sixth through 10th went to Tyler Horst, Bryan Bernheisel, Danny Snyder, Dave Stamm and Larry Baer. Heats went to Eckert, Rine and Frye. Bernheisel set fast time with a lap of 20.800 seconds. Super late models, 30 laps: 1. Jason Covert, 2. Coleby Frye, 3. Tyler Bare, 4. Dylan Yoder, 5. Matt Cosner, 6. Tyler Horst, 7. Bryan Bernheisel, 8. Danny Snyder, 9. Dave Stamm, 10. Larry Baer, 11. Gene Knaub, 12. Chris Casner, 13. Rick Eckert, 14. Jeff Rine, 15. Gary Stuhler, 16. Billy Wampler, 17. Reese Masiello, 18. Mike Lupfer, 19. Jerry Bard, 20. Jamie Lathroum, 21. Matt Nailor, 22. Dave Brouse Jr.